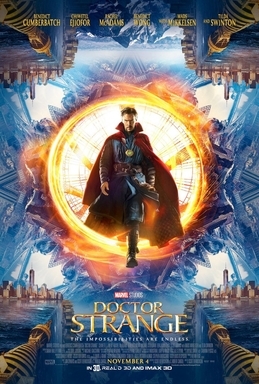 Doctor Strange (2016) Movie Review: Magic In Sparks! Marvel may have started this superhero race at the screens near you a decade back, and if their latest offering, Doctor Strange is anything to go by, it is certain that they have no signs of stopping matters anytime soon. For the folks at Marvel Studios surely know how to deliver a solid origin story, and they have done it splendidly well this time too. Sure, it is a path down the beaten track. Instead of anything strange, you are bound to be in for a whole lot more things familiar. For example, our lead man Dr. Stephen Vincent Strange is not someone you haven’t met before. You have witnessed these Stark-y cockiness, Thor like arrogance, Banner-like brilliance all before. Thus cut from the same cloth is our latest cinematic superhero, Doctor Strange. Stephen is introduced as a highly skilled neurosurgeon whose career comes to a sudden halt due to a driving accident which leaves him with severely damaged nerves. And despite all the advancements that the western medicine has to offer, Strange finds himself unable to be the genius he once was. It is this quest for a suitable cure that takes him to Kamar-Taj (a place that shifted from the Tibet of the comics to Kathmandu) and this is where he meets The Ancient One, who takes him in as a student and helps him find deeper meaning in his existence on his road to recovery and enlightenment. Strange is soon found immersed in the teachings and manages to learn his way up to be a sorcerer who has not only mastered a few tricks but also find himself as a guardian of the Mystic Arts, trapped in a goatee and a sense of eternal duty. Now, for a story line so routine and familiar, it does indeed take some creativity and magic to bring some life into the proceedings and not be just another Matrix – clone. That is exactly where director Scott Derrickson scores by bringing in some trippy visuals that takes some of those memorable Inception-inspired visuals of Nolan to a whole new psychedelic level. There is also a lot more references to Nolan-esque moments like in Batman Begins and Interstellar all thrown in to the mix to conjure up a visually satisfying comic book treat that may come up short writing wise. Thankfully, for a change, the action sequences are more intelligent and full of wit rather than mere noise and fury that we are used to being served with, especially the way the third act plays out. Tilda Swinton is as assuring as the mentor, never putting a foot wrong, while Chiweter Ejiofor has managed to rise above the writing and lay down the base to embrace the dark future his Mordo character is in store for in the forthcoming installments. The other Benedict, Wong does make a lasting impression. Rachel McAdams really does not have much to do and Mads Mikkelson plays out a one dimensional baddie like every other one dimensional baddie proving to be the weak link in the acting department. Not the only weak link, though. The writing and screenplay is a whole playground of it. For starters, we never really sense the struggle that Strange has to go through in his training to mastery of the Mystic Arts. We are never told what exactly makes him unique or superior to all the other masters and sorcerers that have been there before our hero shows up. And even Strange’s abrupt shift of attitude does not translate that well. It was more like he was forced into the situation by the script.And we are forced to take than for an answer. And yet, despite these shortcomings that keep the film from being a truly marvellous affair, it still casts enough spell to be the fun assured dimension-hopping mind-bending zany visual ride that you need to check out. And for best results, you need a true IMAX experience to truly absorb the visual wackiness of it all. And by the mid-credit sequence, you get to know how easily Doctor Strange gets to fit into the bigger scheme of things when an Avenger shows up gulping down over his thoughts! I also enjoyed the movie though I personally thought the plot was a little to straight forward for my taste. Just like Deadpool had a hard sell of hard R so they had a fairly standard plot; I feel like they were worried they were going to scare people with magic and weaponised inception so we get one of the most cookie cutter Marvel movies yet. A feeling Deadpool managed to avoid better. Again don’t get me wrong I liked the movie, just not as much as other Marvel movies.